I went to Fredonia today with my grandpa and sister. Aimee goes to school there, and we went to the bookstore to exchange a T-shirt we bought him for Christmas. While we were there, we went to a little pizzeria called De John’s, in which I found many examples of yesterday’s word of the day: kitsch. Birdhouses hung from every wall, the lighting at the bar was a dim red and Aimee really enjoyed the “pine cones on sticks” they featured in the corner of the dining room. I found this gem in the opposite corner. What do you think? What’s your favorite part of this statue? 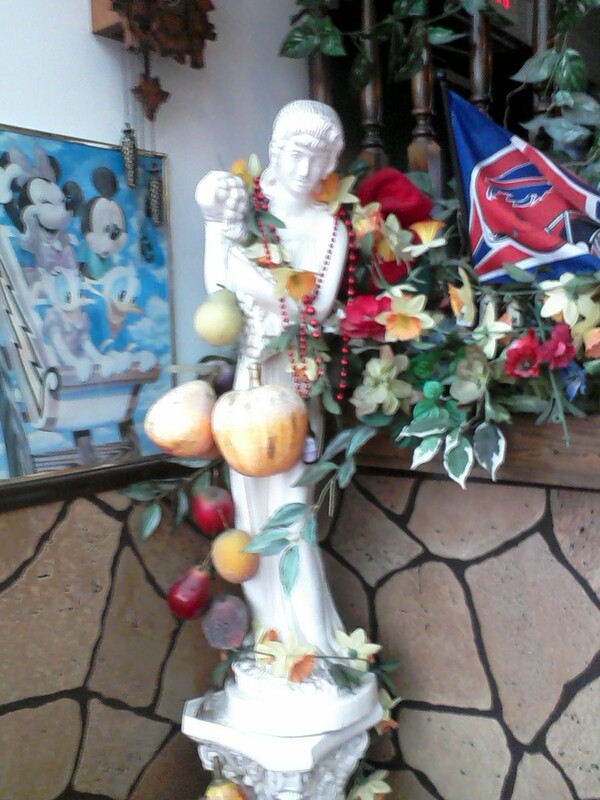 Is it the Bills flag in the background or the fruit hanging from the figure’s neck?